The annual governors’ meeting of the International Monetary Fund and the World Bank opened on October 5 in Peru’s capital city. In the meeting, an estimated 800 representatives from 188 countries were negotiating the shape of the world’s soon-to-be renovated finance infrastructure. More than 1,200 people attended Plataforma Alternativa’s conference. Dozens of young volunteers zoomed through the marbled hallways of Lima’s Hotel Bolívar, which hosted the conference. Participants represented dozens of organizations and countries as diverse as the Netherlands, China, the United States, Belgium, Zimbabwe, Colombia, Indonesia, Spain, Mexico, the Philippines, Germany, Palestine and Argentina. On Friday, an estimated 5,000 people marched across 70 blocks in Lima, from Plaza San Martín to the first of three police perimeters around the official conference. 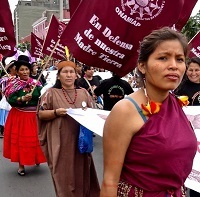 Groups at the protest included indigenous feminist organizations, the Lima-based Comando Feminista, Bloque Hip Hop, worker unions, the Peruvian Campesino Confederation, and dozens of others. Peru reportedly mobilized 20,000 police for this event, many of whom were safeguarding key areas around the city for the 12,000 visitors: from the airport to hotel areas. The counter-conference was free, open to the public, and streamed online. It featured U.S. economist Joseph Stiglitz, a former World Bank chief economist and an outspoken critic of its policies, as its keynote speaker. “Inequality is a choice — not the result of inevitable economic laws,” Stiglitz said in his speech after reminding the audience that Latin America has the highest rate of wealth disparity among world regions. At the end of September, Oxfam — one of several organizations in charge of the conference — released a report indicating that, at the current pace, one percent of Latin Americans would be wealthier than the remaining 99 percent by 2022. “The neoliberal economic model minimizes states and makes them mere functions of economic power,” said Mirtha Vásquez, a lawyer who works with the rural development organization Grufides. Her conference panel also featured Máxima Acu?a, an agriculturalist from the Peruvian Andes who has become famous worldwide for standing up to the world’s largest gold company, Yanacocha. The new documentary film “Hija de la Laguna,” which features Acu?a, was screened after the panel. It was the first time Acu?a had seen it. Given Peru’s recent experiences with deadly conflicts surrounding mining projects like Tía María, Las Bambas, and La Oroya, it is perhaps understandable that many of the panels focused on conflicts related to extractive industries. For two decades, the Peruvian state has adopted natural resource extraction as the leading engine for its economic growth — under the guidance and financing of the World Bank and IMF. A study presented at the conference by the Peruvian investigative organization Convoca found that between 1994 and this year, almost 30 percent of all financing from the World Bank Groups’ International Finance Corporation, or IFC, had gone to extractive projects. The IFC has a five percent stake in the mining project that will require Acu?a’s displacement. As the global price of mineral commodities boomed up to its peak in 2013, Peru’s government promptly expanded the scope of extractive activities in its territory. At the same time, however, the number and intensity of social conflicts over these projects also escalated. The ombudsperson’s office documented 223 active socio-environmental conflicts in mid-2013. The same report noted that 196 people were killed and 2,369 were injured in conflicts over natural resources between 2006 and 2011. Most of these tragedies surrounded mining projects. The frequency of conflicts surrounding such projects has also been bad for business. 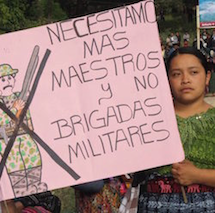 Today, industry advocate and economist Hernando de Soto estimates that protests currently paralyze $70 billion dollars of mining investment in Peru. A few months ago, IMF President Christine Lagarde argued that Peru’s natural resources would ensure it would develop to levels reaching Canada and Australia within only a few years. Earlier this month, however, the IMF released a report suggesting that Latin America was headed towards the first recession since the end of the global financial crisis, owing to the global economy and reduced demand for raw commodities. Attention at the conference has centered on the recent signing of the Trans-Pacific Partnership, or TPP, a 12-country trade agreement that includes Peru, Japan, Mexico, the United States, Australia and Canada. The TPP includes some labor and environment protection measures lauded by U.S. President Barack Obama as new and “absent in previous agreements.” However, according to José de Echave, a former Vice-Minister of Environment in Peru, the 2007 free trade agreement between the United States and Peru already included these standards, and in fact served as a template for their wording in the TPP. De Echave notes that rules within the 2007 trade pact prohibited the rollback of environmental and worker protections. However, in the last two years alone, President Ollanta Humala’s government has approved a series of five reform packages meant to “encourage investment” by altering approval processes and the power of the state’s environmental oversight organization. That the Obama administration has failed to enforce rules set by that earlier agreement is a sobering check on the U.S. president’s optimism about the TPP. 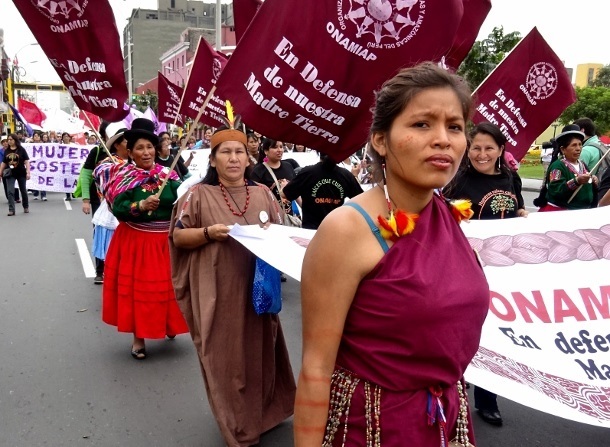 Only six years ago, the international political economy made its presence felt in Peru, when it underscored an escalating set of tensions that culminated in the Bagua massacre. Near that Amazonian city, national police were ordered to open fire on indigenous protestors — including members of AIDESEP — who were blocking a highway to demand that the state repeal concessions over their territory granted to logging, oil, and other extractive industries. Some of the protesters retaliated and wounded several police. Leaked cables from the U.S. ambassador warn the Peruvian government that, were it to “give in to the pressure, there would be implications” for the treaty. The violent confrontation in a remote part of the country crystalized the uneasy meanings of “development” according to the Peruvian state and its international financial supervisors. ?Will the Economic Policies of Argentina’s President Survive Sunday’s Elections?